I was that dork in high school who stayed home and worked jigsaw puzzles. Do you remember that Friends episode where everyone was teasing Monica because she was fat and stayed at home working jigsaw puzzles when she was in high school? Well I wasn't fat, but I sure as hell stayed home A LOT and did jigsaw puzzles ALL DAY! My dad had a big drafting desk that he didn't use anymore because all his house designing was done on computer. There was no place to put this huge thing except in my room. We lived in a tiny apartment while I was in high school. It was the perfect surface to work huge jigsaw puzzles. Like the ones with 3000 pieces huge! Hmmm... maybe that is why I didn't have many friends? I'd like to think it was because I was too cerebral for others my age, but really I've always been terrible at making friends. But the ones I have are friends for life - right Chelsea? (Chelsea has been my best friend for 26 years). And I still put one together every now and then. My mother in law sent me this one for Christmas a few years ago. Frogs! Ever since then, I try to do a puzzle every Christmas Eve. My aunt used to come over and help me and I still try by myself every year (Terry is the type that wants to put the pieces in using a hammer so they fit wherever you want them to). I did this one as one of the Christmas puzzles when Terry and I lived in our tiny one bedroom apartment. I remember baking Christmas cookies and listening to carols on the computer and working this puzzle. Good times. And last night I started another one. I'm needing some time to think about how I'm going to make Lane's curtains, so I set it up on my sewing desk. This ensures that I won't touch my sewing machine until I'm done the puzzle. It's a good way to find time to calm, relax and think when things get overwhelming. What do you do to chillax? 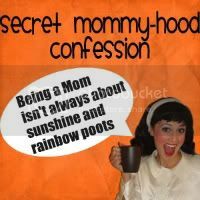 I'm sharing this dork-tastic confession over at All Work and No Play Make Mommy Go Something Something. Hey, whatever works to relax your brain - or at least let it focus on something else for a while. I need to find something like that. Have been considering buying a colouring book. Seriously.